"And there were in the same country shepherds, abiding in the field, keeping watch over their flock by night. And, lo, the angel of the Lord came upon them, and the glory of the Lord shone round about them! And they were sore afraid ... And the angel said unto them, "Fear not! For, behold, I bring you tidings o great joy, which shall be to all my people. For unto you is born this day in the city of David a Saviour, which is Christ, the Lord." "And this shall be a sign unto you: Ye shall find the babe wrapped in swaddling clothes, lying in a manger." And suddenly, there was with the angel a multitude of the Heavenly Host praising God, and saying, "Glory to God in the Highest, and on Earth peace, and good will toward men." 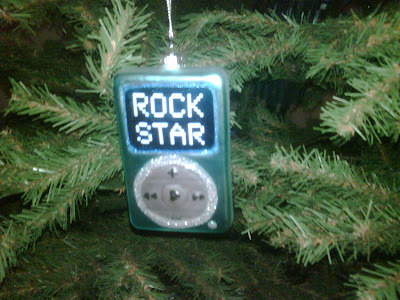 My daughter Courtney was very excited that she found this ornament and gave to me as an early Christmas present. Every time I see it I'm sure I'll remember her excitement. Although she didn't recite Luke like Linus does, this is also what Christmas is all about.